Lots of black border embroidery. And i only have two months left. 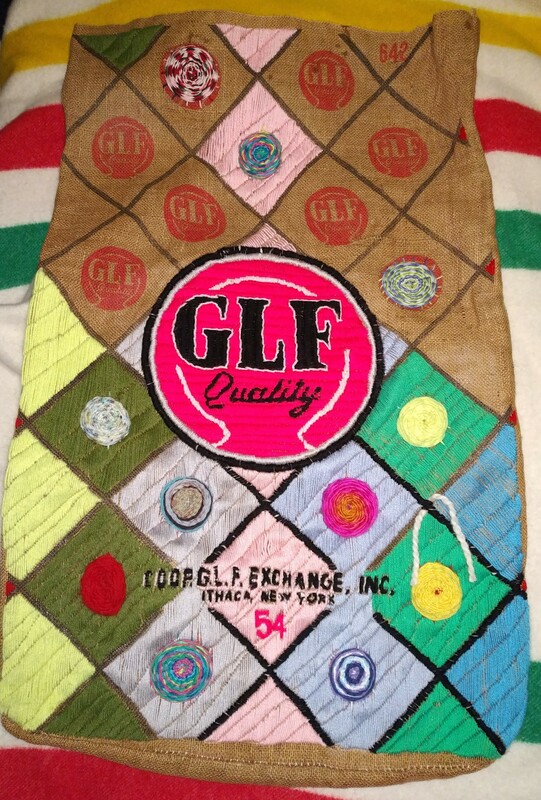 You might be following my current art project, the GLF Quality embroidery project. 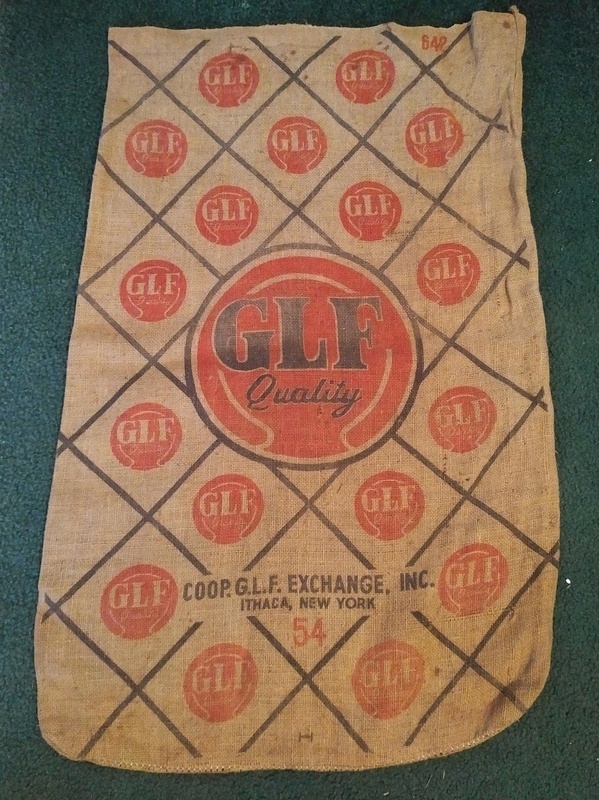 This 100-pound burlap feed sack, sold at GLF (Grange League Federation) co-ops throughout New York, has a nice looking pattern printed upon it. And I’ve been stitching the pattern up with various colored and multicolored yarns for the past couple of months. And then you know what happens? I get distracted. 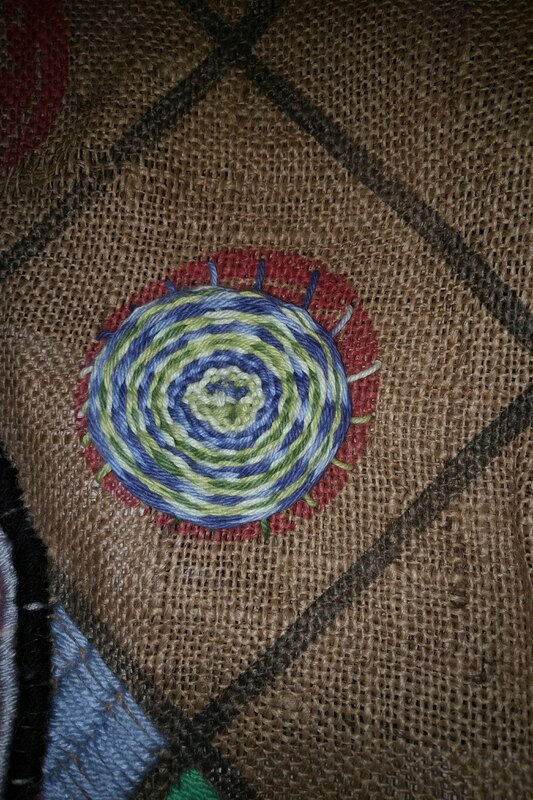 And I end up stitching another sack together – the Eastern States Farmers’ Exchange sack, to be precise. That one’s done. And it’s going in competition this year for sure. Then I went back to the GLF Quality embroidery project. And I worked on it for a couple more months … and what happens? I got distracted AGAIN. Two Saratoga Vichy wooden crates? Now I have a table. And yes, THAT is going into competition as well. But I really, really want this GLF Quality burlap sack to get in competition. And by “get in competition,” I mean to be entered THIS YEAR. Now we figure that for me to enter this piece in competition for 2018, I need it done by no later than mid-July. July 1st would be a proper deadline, July 15th would be a “my term paper’s almost done, professor, I just need an extension,” and maybe July 31st would be a “no, no, I haven’t forgotten it, I can finish it with an all-nighter of Red Bull and a marathon of Investigation Discovery episodes” situation. So I’m trying to motivate myself. To keep at this. To not procrastinate or give up. 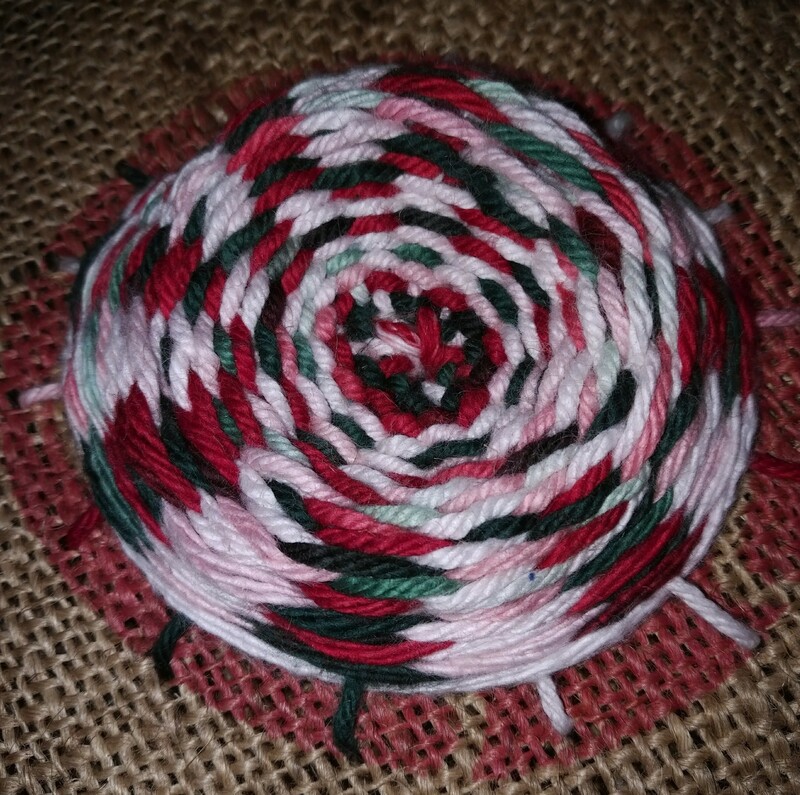 Every time I finish a rosette, I post the rosette on Instagram and on Facebook. I need to keep this going. I mean, looky doodles, I’m only eight rosettes away from completion. 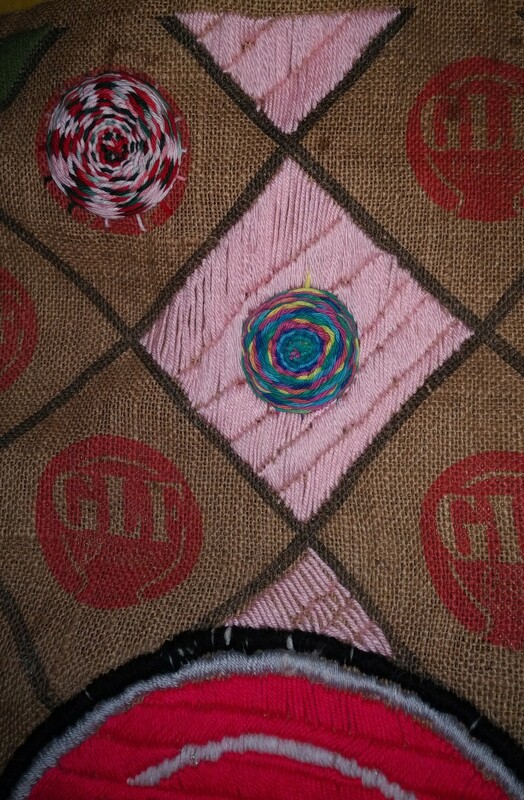 Each rosette is being woven over the old “GLF Quality” logos in the small squares. And I wanted to make sure that every diamond panel had solid bright colored yarn. And the other day, I completed one full column – the center set of diamonds from base to opening. If the base diamond was pink, I made sure that every diamond directly above it was pink as well. I’m competing against the calendar. If I don’t get this done in time, it’ll sit in my place for a year and someone else will stitch up a burlap gunny sack and create something better than what I’ve got now. Oh look, I completed another rosette. Just six more to go. Each square needs its rosette first. Then I can stitch the background solid color. Then, I can stitch up the black outline borders between each diamond. This is good. In fact … just so you can see where I am with this project … this is how far I’ve gotten, up to last night. See? Each colored square has the same matching color directly above it. And you can see how the black outlines are reinforced, especially on the lower right side of the sack. The center logo still looks great. Now it’s just a race against time. I can do this. I have enough yarn left over for this project. I just have to stay the course. Look, it’s either this or I go build another Dream Window. Or I tear apart another wooden crate. Or I do something that will take my time away from this. Okay. I want to aim for the July 1st deadline. But if it goes to July 15th, I can still finish it. But I can’t go past July 31st. Trust me, if I’m still working on this on July 32nd, there’s more than one problem. That, and my calendar is very faulty. Back to work. No stalling, no kvetching, no putting off until tomorrow what you can do next week. Keep stitching!!!!! You’re almost in sight of the finish line!!!! I’m almost done with mine! I should have it ready for competition after this weekend.